The author is a biology major interested in wildlife ecology. How did she incorporate her interests into the research and analysis of this History USEM paper? How does she bring science into the argument she is making, and how does her argument suggest new ways to think about science from a cultural or historical perspective? One of this essay's strengths is the wide variety of primary source material the author uses to illustrate what bison meant to Americans in the late 19th and late 20th centuries. Identify four different kinds of primary sources the author uses and discuss what those sources reveal exactly. Who, in each case, was creating the animal's meaning and how? This paper covers a lot of historical ground by connecting an analysis of primary sources from two time periods. In order to keep the focus on her own research and analysis, Brown gives just enough background information and historical context for readers to understand each period without distracting them from her own argument. Identify where she does this in the text. What information did she decide to include in those paragraphs, and what kinds of things did she leave out? What other choices could she have made, and what impact would that have on the flow of her argument? One important way authors develop their arguments in the body of their papers is by using strong topic sentences or concluding sentences to illustrate how that section of analysis or body of evidence supports their main thesis and argument. They leave "signposts" so readers can locate where they are in the larger structure of the paper, remembering where they have been and pointing towards the way ahead. Identify five of Brown's signpost sentences and think about how they work. What happens when you put them together in order? With pieces of grass escaping the depths of its mouth as it vigorously chews, a bison grazes amongst the sprawling open plains of Yellowstone National Park. At a quick glance, the animal appears to be just another creature we share our country with, but it is different. It is unique, fitting in perfectly with the scenery. Its domineering horns and iconic hump match the towering majestic mountains that surround the fields of wild grass. It seems to be the heart and soul of Yellowstone, a symbol of the national park system. How is this animal more than just a grass guzzling grazer? In the 1500s, approximately 30 to 60 million bison freely roamed the American West, ranging from the Mexican border to Canada. When European settlers arrived and spread across the country, the buffalo population and range drastically dwindled. According to historian Dan Flores, the bison's slide towards extinction began with the Plains Indians' introduction to horses. As the number of horses on the plains rocketed into the millions, the carrying capacity of bison plummeted since bison and horses share approximately 80% of the same dietary requirements. Competition for resources increased as Euro-Americans moved West, bringing with them cattle plagued with foreign diseases. Though it is not certain, bovine diseases like brucellosis and Texas fever are believed by many, including Flores and historian Andrew Isenberg, to be a factor in the decrease in the population numbers. Human interference with populations of cattle predators inadvertently harmed the bison, as poisoned wolves spread harmful chemicals onto the grass of the plains as they drooled and died. The creation of the railroad plagued the animals. When finished, the Union Pacific Railroad spilt the original herd into two sections. Later, the Santa Fe and Northern Pacific Railroads continued to disturb the creatures' habitat while also increasing the range for hunting. More railroads meant more access to the plains of the West. As a result, wealthy men began to participate in recreational hunting of bison. Adventurous young men in search of a fortune often took to the West to work as hunters for the railway companies who needed to feed their crews with bison meat. Despite its dwindling numbers, the image of the bison continued to have cultural significance to the American people. As Euro-American society shifted its ideals from purifying the country of savagery to perpetuating the ideals of the West to the present-day focus on environmentalism and maintaining national ideals such as freedom, the bison's significance evolved. To analyze the evolution of the significance of the bison to Yellowstone National Park and our national identity, the societal and political influences of the late 1880s to early 1900s will be compared with those of the late 1990s to present day. During the mid to late 1800s, anti-Native American sentiments ran high as many Anglo-Americans hoped to eradicate the Indians from coveted farming land in the West. The dependence of Native Americans on bison as a source of food, clothing, and spirituality lead the animal to be viewed as a solution for the "Indian problem." Associating bison with savagery, Anglo-American society knowingly promoted and glorified the hunting and extinction of bison as a means to eliminate the Indians. When hunter, Sir William Butler, shot over 30 bison on a trip through an Indian reserve, Colonel Dodge, an army officer 'protecting' this area, responded with, "Kill every buffalo you can; every buffalo dead is an Indian gone." Writing in his autobiography, Butler admitted that such an attitude seemed harsh after, "the destruction of so much animal life," but the, "smiling plain of farms, waving crops, and neat homesteads," that later thrived due to the destruction of the Indian reserve was worth the loss. This sentiment pervaded throughout the country. The plains needed to be cleared of the Indians to allow the country to support its expanding population, and the capitalistic ideals of the industrial time perpetuated the association between bison and Indians by viewing hunting as a means to achieve great wealth and success. Many feared the United States had lost the true definition of a man through the industrial period's replacement of man with machines. With the country's focus on exterminating the Indians, hunting evolved into the new method for men to prove their power and strength. As the slaughter of hundreds of 'savage' bison developed into a national recreation and source of income, society began to also identify bison with masculinity and strength. Originally named William Frederick Cody, Buffalo Bill earned his nickname by killing close to 5,000 bison throughout a period of 18 months. Cody's reputation as a courageous hunter and scout defined him in the eyes of the country as the quintessential, rugged man, and an iconic symbol of the West. 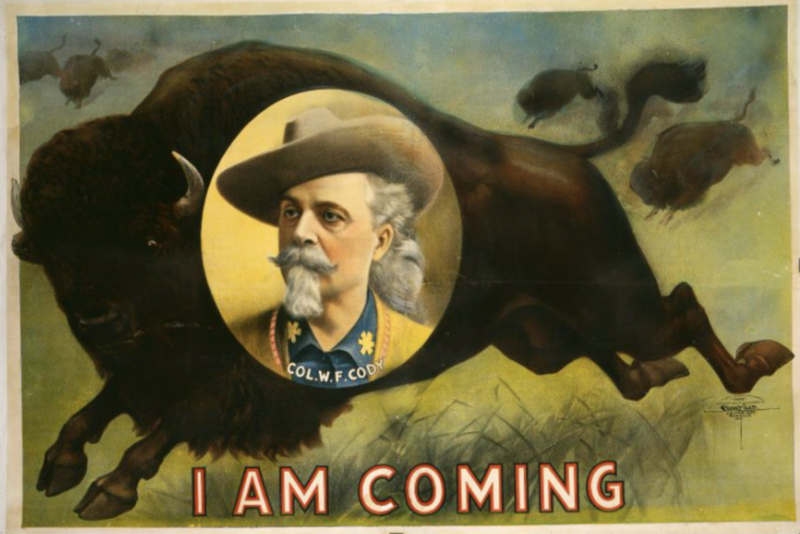 Cody's influence on the image of the bison continued through his iconic production, Buffalo Bill's Wild West Show. Building off of his time out on the Frontier, Cody recreated supposedly authentic scenes of the West in his show such as roping, sharp shooting, historical reenactments including Indians, and the hunting of bison. His goal was to spread the ideals of the West and the perfect American man: a hunter and conqueror of the savage. By choosing to include bison in a show that highlighted the lawlessness of the West, the bison became further entrenched in their association with Indians and the idea of wilderness. The bison's association with the wild Frontier strengthened as the show expanded in popularity and range. Over a period of 200 days in 1899 alone, Buffalo Bill's Wild West Show travelled over 11,000 miles in the United States to perform 341 times in 132 cities with each city receiving two performances and a parade. The production also gained recognition internationally when Queen Victoria made her first public appearance since her husband's death at Cody's show. The queen enjoyed the show so much she requested it be performed again on the eve of her Jubilee. Royals from Belgium, Greece, Saxony, and Denmark also viewed the reenactments. After his success in England, where he performed to a stadium filled with over 30,000 fans, Cody and his show travelled across Europe providing France, Spain, Italy, Germany, and many more countries with the Western experience. Its success and recognition as a historical production led the world to affiliate the bison with American Western wilderness. In order to gain such success and high attendance, Cody used promotional posters and pamphlets to advertise his show. Appearing across the globe, these posters and pamphlets perpetuated the romanticism of bison by presenting the creatures alongside iconic symbols of the West and emphasizing their wild nature. For instance, in Figures 1 and 2, the creatures appear to be galloping across the plains with a wild look in their eyes. Figures 3, 4, 5, and 6 emphasize the bison's affiliation with the masculinity by highlighting a pack of buffalo being chased by hunters. None of the posters depict the bison peacefully grazing in the plains of the West nor do they show their gentle nature. Instead, the creatures are demonized for their relationships with the Indians, appearing unruly and wild to the public who viewed these posters. Through his iconic name, tales of hunting and renowned show, Cody defined the bison as wild and a symbol of the untamed West. As the public worried about the loss of the Last Frontier, the bison's ties to the Wild West caught the attention of men who wished to preserve the masculinity and courage associated with the waning era of cowboys. These men decided to create organizations like the Boone and Crockett Club and the American Bison Society as a means to actively fight for the protection of the bison. Members knew that in order to ensure continued hunting of bison and thus the preservation of masculinity, the population must be maintained and protected. So, founding members of the Boone and Crockett Club, Theodore Roosevelt and George B. Grinnell, used their political power to shift the public's attention away from the slaughtering of bison and more towards its symbolism of freedom and majesty. FIGURE 3: Scenes in the Life of Col. W. F Cody, "Buffalo Bill." 1895. McCracken Research Library, Buffalo Bill Center of the West. Grinnell used the platform of his magazine, Forest and Stream, to shift the buffalo's identity from machismo to an iconic symbol of the country. Emphasizing the importance of the bison's preservation, he published articles that endorsed the U.S. military and their work to protect the bison in Yellowstone National Park. Specifically, Grinnell included a detailed rendition of the capture of notorious poacher Ed Howell. Buffalo Bill Center of the West. Roosevelt took advantage of his influence as Honorary President of the American Bison Society, founder of the Boone and Crockett Club, and president of the country to shift the national government's attention towards establishing the bison as an icon of majesty, manliness and the Frontier. Originally, the bison enamored Roosevelt because of its significance to the West and its association with masculinity. In founding the Boone and Crockett club, Roosevelt hunted bison avidly. Yet, as his contact with the creatures increased, Roosevelt's view of the bison evolved. In his book, Hunting Trips of a Ranchman, Roosevelt described the experience of hunting bison as, "half melancholy," because he felt a sense of remorse in killing, "the last remnant of a doomed and nearly vanished race." He then goes on to describe the creatures as, "lordly," and, "the mightiest of American beasts." While he may have once reveled in the thought of felling a bison, Roosevelt's experiences out on the plains shifted his interpretation of the creatures, and he began to view them as more than just a symbol of manliness. Instead, they were creatures that represented majesty and freedom. Though his book undoubtedly shared his change in point of view with some of the public, his words addressing bison in the President's annual message to Congress publicized his commitment to shifting the bison's identity away from the savagery of Indians. In this public statement, Roosevelt states that the bison, "should not be allowed to go out of existence," and the government should protect them, "either on some reservation or on some forest reserve like the Wichita Reserve." His persistence in convincing the government of the bison's ties to the country's identity eventually allowed for the creation of reserves for bison like the Wichita Mountain Reserve. 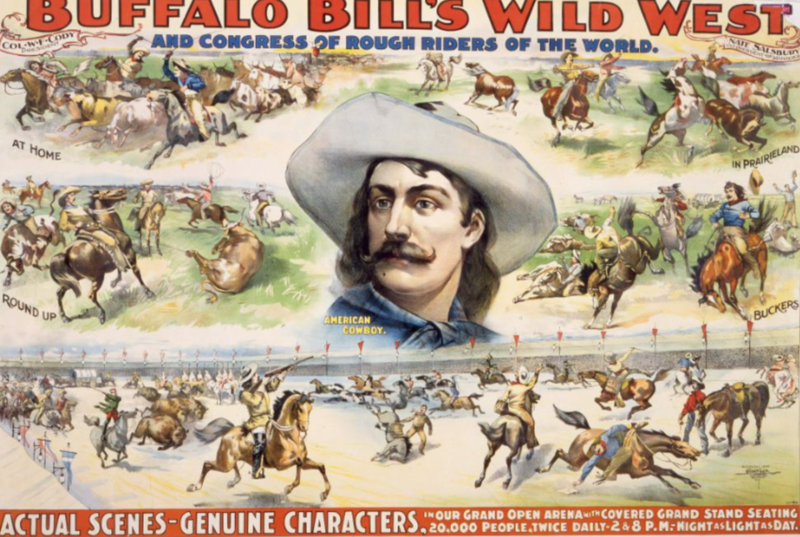 FIGURE 5: Buffalo Bill's Wild West Poster. 1910-1911. With the support of influential people like President Roosevelt, the National Bison Society bolstered the fight to shift the bison's national identity. William A. Hornaday founded the American Bison Society as a sect of the New York Zoological Society with the goal of, "preserving and increasing the American bison." Hornaday and other members of the club wrote letters to businessmen and government officials pleading for support in immortalizing a creature tied to the dying Frontier. In a response to a letter written by club member Ernest Baynes, Roosevelt conceded that he would, "request [Secretary Wilson] to take the matter [of bison repopulation and preservation] up with [him]," and, "treat of it in [his] annual message." Thus, the organization quite possibly influenced the content of Roosevelt's 1905 address to Congress. To spread their message nationally, the group toured Sportsmen shows where they set up exhibits that featured both live bison and taxidermies to demonstrate the majestic nature of the bison and emphasize the need to protect these iconic creatures. As society shifted away from identifying the bison with hunting, masculinity and savagery, the government began to support the bison as an icon of wilderness and the Last Frontier through repopulation programs and legislation. By the late 1800s, Yellowstone's population of bison bottomed at approximately 25 to 30 bison, and poachers and hunters continued to destroy this population despite the area's national park status. As a result, the government decided to physically protect the population by instituting a military presence within the bounds of the park in 1886. Writing in his journal, Superintendent Second Lieutenant George Goode describes the plight of the bison saying, "it is scarcely possible… that these animals can be protected from the cupidity of the hunter and the wanton and more than savage barbarism that has exterminated the herds of buffalo." The range and expanse of the park made it difficult for the military to completely protect the herds and patrol for poachers and hunters. The army did, however, succeed in catching poachers such as Ed Howell, but once caught, culprits often faced limited ramifications. A culprit may lose the carcasses as Howell did, but not face harsher legal punishments. This encouraged the government to fortify the protection of the animals through legislation. Responding to the national uproar surrounding Ed Howell, the government passed the 1894 Protect the Birds and Animals in Yellowstone Act which officially banned hunting within the bounds of the park. The government continued to strengthen its position against poaching of bison through the passage of the Lacey Act in 1900 which prohibited the exportation of organisms obtained illegally or organisms killed within park bounds. To replace the bison lost to hunting, the government began to repopulate Yellowstone. In 1902, the army started roundups, winter feeding and culling of aged animals, and in 1906 established the Lamar Buffalo Ranch. The Ranch aimed to increase the wild population by buying privately owned bison, breeding them, and then eventually reintegrating them. The government's decision to foster and to protect bison within the bounds of Yellowstone National Park intertwined the identity of the bison with that of the park system. These animals represented the parks' wilderness, freedom, and majesty. Through the support of organizations like the American Bison Society, Buffalo Bill, and the United States government, the bison population in Yellowstone and across the nation began to thrive. 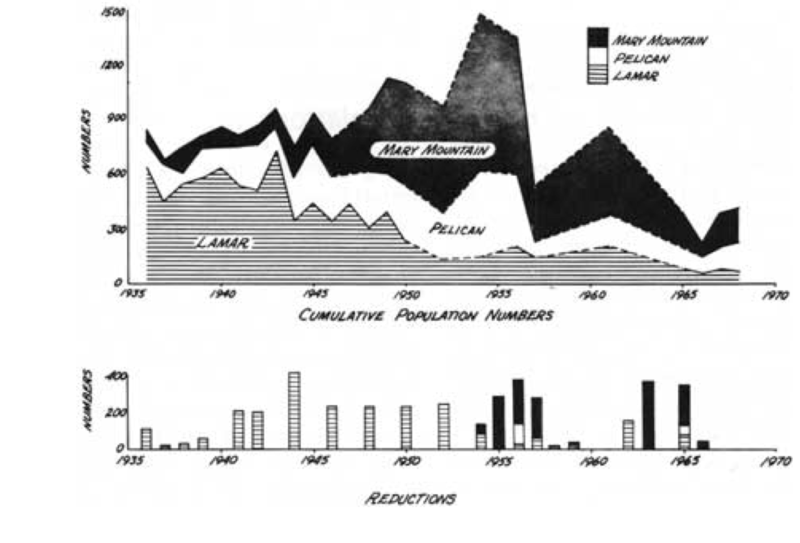 As shown in Figure 7, the number of buffalo in the Lamar region of the park escalated well into the hundreds by the 1940s, and by the 1950s the total population of buffalo in the park rose above 1,000. When groups such as the American Bison Society began to see increases in the population both in Yellowstone and their other reserves, they felt they had achieved their goals: the bison would continue to thrive on the plains of the West reminding the country of the Last Frontier. Hornaday went so far as to say, "we need no further fear that the American Bison will ever become extinct so long as civilized man inhabits the continent of North America." Without a true purpose, the American Bison Society ceased to exist by the 1930s. It was around this time that a shift between public and private bison herds began. As the programs from the early 1900s successfully increased population size on public reserves like Yellowstone, the government began to sell surplus bison to private ranches, initiating a shift in the bison's identity. With the second World War in the 1940s came a demand for more meat available to feed the people. As a result, ranchers turned towards their private herds of buffalo whose meat could be sold at a higher price due to its, "novelty." The demand for bison meat augmented as society learned of its lower cholesterol levels and other health benefits, and by 1996 over two hundred thousand bison thrived in the privately-owned ranches. This is compared to an average of 30,000 bison that are kept up for preservation reasons, including the approximately 5,000 bison that live in Yellowstone. By the mid 1990s, the ranching industry had altered the bison's identity in the eyes of the nation, touting the beasts as a commodity. The bison's connection with the disease bovine brucellosis has led to a devolution of the bison's identity, as ranchers increasingly view the bison as a domesticated animal. Originally found in cattle, the disease bovine brucellosis transferred to the Yellowstone bison population when ranchers introduced cattle to the western plains. A large portion of the population now tests positive for the disease. With ramifications such as abortions, non-viable calves, and contaminated meat, the disease can cause billions of dollars in economic damage as infected meat cannot be sold on the public market. Though there has yet to be a recorded case in which a bison transferred brucellosis to cattle, Montana, Idaho, and Wyoming strongly support the regulation of bison populations in Yellowstone to prevent contamination. For the state of Montana, this meant suing the National Park Service in 1995. The state claimed that the park did not sufficiently control the bison population because management allowed the creatures to leave the bounds and interact with cattle. This lawsuit ultimately resulted in the Interagency Bison Management Plan (IBMP) which permitted the park management to treat the bison as livestock. Instead of allowing the bison to roam freely, the park officials ranched the animals by manipulating the population via thinning and selling. The park slaughtered an estimated 3,580 bison since 2000 because of the IBMP and the crusade to prevent the spread of brucellosis. Such culling of the population occurs because the ranchers who control the states' government no longer view bison as icons of the country and its ideals. Instead, the ranchers associate bison with domestication. In their industry, bison are sold as meat, and treated as a commodity by fellow ranchers. Though not a part of private herds, the Yellowstone bison are viewed no differently in the ranchers' eyes. The creatures are not wild, untamed beasts but domesticated animals that can and should be controlled. While ranchers associated the bison with the livestock industry, many Americans, specifically tourists, still viewed the Yellowstone bison in particular as an iconic symbol of freedom and wilderness. The National Park Service perpetuates the identity of the bison through its presentation of the Yellowstone's website to tourists. The homepage emphasizes the serene majesty of the bison's past identity through Figure 8. FIGURE 8: "Yellowstone." National Park Service. By placing the bison in the background of the image in a field of snow, the park service takes advantage of the past identity of the bison as an icon of wilderness and freedom. The presence of hikers in the foreground emphasizes the fact that in Yellowstone one can escape to another world and experience a majestic landscape. Despite the thousands of other organisms in Yellowstone, management decided to represent the park to the world with an image of the bison, proving its allure and significance to the park remains. The park fails to emphasize the rancher's interpretation of the bison. Management hides the bison population control plans within the website, and one must search to discover this information. The website the park provides regarding Bison Management is very vague. It mentions the Interagency Bison Management Plan, but fails to discuss what the plan entails. Likewise, the park briefly highlights its thinning programs writing, "We understand that many people are uncomfortable with the practice of capture and slaughter. We are too, but there are no other options at this time." Such manipulation of information shows the National Park Services goal to maintain the tourists' association of bison with Yellowstone and the wilderness. Environmentalists subscribe to the identity of the bison as a symbol of the American west and are working towards altering the discrepancy between the private and public bison. In 2006, the New York Zoological Society reinstated its sect, the American Bison Society, to address the issues of bison population management. By working with the government to institute National Bison Day, the first Saturday in November, the group fought to gain public attention for the mistreatment of a national icon and reignite discussions about the animals' historical and cultural significance. President Obama supported these efforts to alter the bison's national identity by signing a bill in 2016 that named the bison the national mammal of the United States. The bill romanticized the bison recounting its historical significance, economic impact, and overall value to the country. The legislation's passage brought the issue of the bison's split identity to national attention. Media organizations like The New York Times and The Washington Post published articles about the irony behind a law that deems the bison an icon of our country's ideals, but does nothing to stop the government's annihilation of the population for economic reasons. As a symbol of our country and Yellowstone, the bison's continuously shifting identity shapes the purpose and responsibility of the National Park Service and represents the cultural beliefs of Euro-American society as a whole. When its identity evolves so does the sentiments of the time. This remains today as proven by the bison's identity returning to its connections with the wilderness and freedom because of concerns about nationalism amongst government turmoil and environmentalism. The bison continues to be a unique mammal that represents the essence of being American; whatever that may mean at the time. U.S. Fish and Wildlife Service. "Time Line of the American Bison." Accessed Dec. 6th 2017. https://www.fws.gov/bisonrange/timeline.htm. Flores, Dan. "Bison Ecology and Bison Diplomacy: The Southern Plains from 1800 to 1850." The Journal of American History 78, no. 2 (1991): 481. Isenberg, Andrew. The Destruction of the Bison. (New York: Cambridge University Press, 2000), 140. Buffalo Herds. "American West." http://www.americanwest.amdigital.co.uk/Maps#. Isenberg, Andrew. The Destruction of the Bison. (New York: Cambridge University Press, 2000), 162. Isenberg, Andrew. The Destruction of the Bison. (New York: Cambridge University Press, 2000), 170. "William F. Cody." PBS.org, 2001. <http://www.pbs.org/weta/thewest/people/a_c/buffalo...>. Isenberg, Andrew. The Destruction of the Bison. (New York: Cambridge University Press, 2000), 174. Fees, Paul. "Wild West shows: Buffalo Bill's Wild West." Accessed Dec. 6 2017. <https://centerofthewest.org/learn/western-essays/w...>. Rydell, Robert W. and Rob Kroes. "Buffalo Bill in Bologna." In The Americanization of the World, 1869-1922. Chicago: University of Chicago Press, 2005. <http://www.press.uchicago.edu/Misc/Chicago/732428....>. ""I Am Coming," 1900. Courier Litho Co, McCracken Research Library, Buffalo Bill Center of the West. <https://collections.centerofthewest.org/view/i_am_...>. Scenes in the Life of Col. W. F. Cody, "Buffalo Bill". 1895. McCracken Research Library, Buffalo Bill Center of the West. <https://collections.centerofthewest.org/view/i_am_...>. 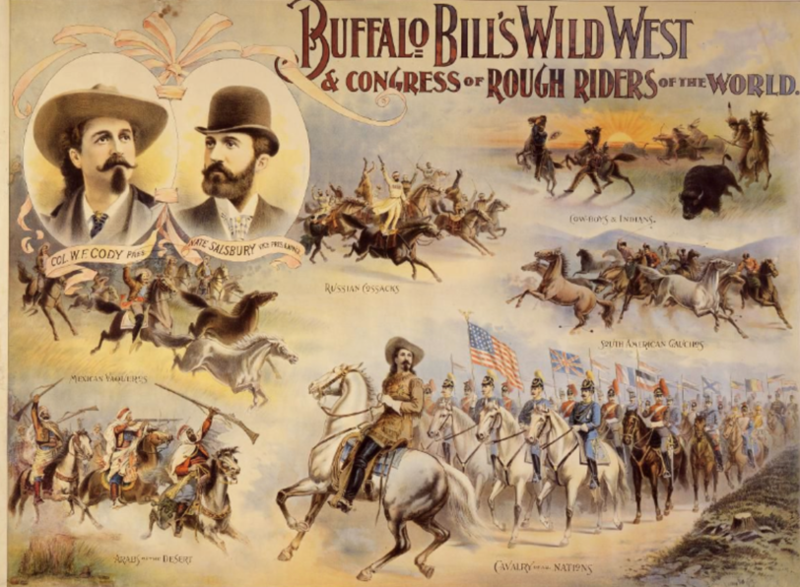 Buffalo Bill's Wild West & Congress of Rough Riders of the World. 1895. McCracken Research Library, Buffalo Bill Center of the West. <https://collections.centerofthewest.org/view/buffa...>. Hon. W. F. Cody Buffalo Bill, Chief of Scouts and Guides for U.S. Army. 1876. McCracken Research Library, Buffalo Bill Center of the West. <https://collections.centerofthewest.org/view/hon_w...>. 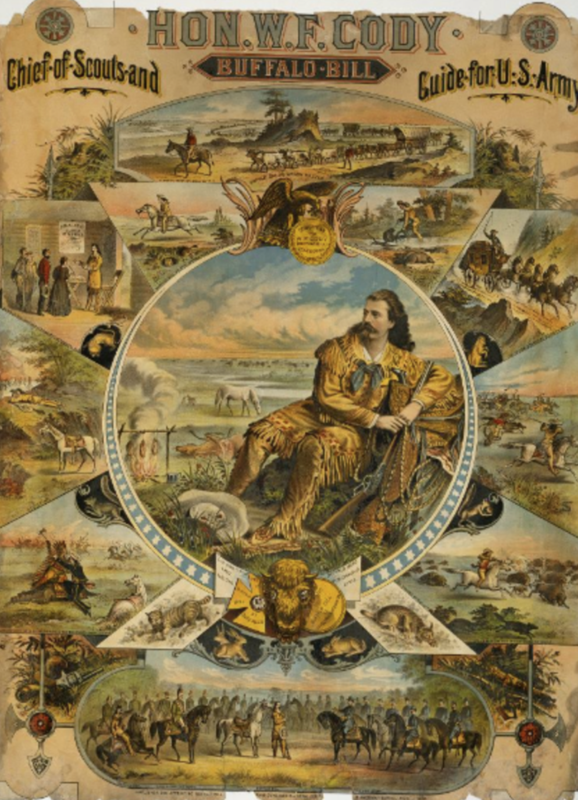 Buffalo Bill's Wild West Poster. 1910-1911. William F. Cody Collection, McCracken Research Library, Buffalo Bill Center of the West. <https://collections.centerofthewest.org/view/americancowboy?q=Poster&partial=0&bbm=1&wg=1&cfm=1&pim=1&dmnh=1&ondisplay=0&offset=181&maxOffset=214>. Isenberg, Andrew. The Destruction of the Bison. (New York: Cambridge University Press, 2000), 175. Roosevelt, Theodore. Hunting Trips of a Ranchman and the Wilderness Hunter. New York: The Knickerbocker Press, 1885. https://books.google.com/books. Roosevelt, Theodore. "Fifth Annual Message." Dec. 5 1905. The American Presidency Project, <http://www.presidency.ucsb.edu/ws/index.php?pid=29...>. "American Bison Society Meeting and Workshop 2016: The Cultural and Social dimension of Bison ecological restoration," American Bison Society. 2016. <http://www.ambisonsociety.org/American-Bison-Socie...>. Annual Report of the American Bison Society, (American Bison Society) 2-10. <https://babel.hathitrust.org/cgi/pt?id=coo.31924071527612;view=1up;seq=11>. Annual Report of the American Bison Society, (American Bison Society) 2-10. <https://babel.hathitrust.org/cgi/pt?id=coo.3192407...;view=1up;seq=11>. Oberhansley, Frank. "Buffalo in Yellowstone Park." Yellowstone Nature Notes. Vol. XIV, (Feb. 1937). <https://www.nps.gov/parkhistory/online_books/yell/...>. Goode, George W. Report of the Superintendent of the Yellowstone National Park to the Secretary of the Interior. (Washington: Government Printing Office, 1889), 19. Morrison, Jim "How the U.S. Army Saved Our National." Lacey Act, 18 USC 42-43 and 16 USC 3371-3378 (1894 and 2008). Sellars, Richard West. Preserving Nature in the National Parks. (New Haven: Yale University: 2009), 7-41. Herbert, Neal. "Lamar Buffalo Ranch Historic District." Isenberg, Andrew. The Destruction of the Bison. (New York: Cambridge University Press, 2000), 185. Isenberg, Andrew. The Destruction of the Bison. (New York: Cambridge University Press, 2000), 188-189. National Park Service. "Frequently Asked Questions: Bison," Accessed Dec. 6 2017. <https://www.nps.gov/yell/learn/nature/bisonfaq.htm>. White, Wallen and Hallac, "Yellowstone Bison: Conserving an American Icon in Modern Society, 30. National Park Service. "Yellowstone," Accessed Dec. 6 2017. <https://www.nps.gov/yell/index.htm>. "Bison Management." National Park Service. Oct. 9th 2017. <https://www.nps.gov/yell/learn/management/bison-ma...>. National Park Service. "Bison Bellows: Wildlife Conservation Society and American Bison Society." Accessed Dec. 6 2017.< https://www.nps.gov/articles/bison-bellows-4-7-16....>. "Senate Passes Resolution Commemorating Sat. Nov. 4 as National Bison Day." WCS Newsroom. November 1st 2017. <https://newsroom.wcs.org/News-Releases/articleType...>. U.S. Congress. House of Representatives, The National Bison Legacy Act. 114th Cong., 2d sess., 2016. <https://www.govinfo.gov/content/pkg/BILLS-114hr290...>. Brianna Brown is a Biology and Spanish double major from New Jersey. In the future, she intends to pursue a career in research that hopefully allows her to also use her love for and knowledge of Spanish. After learning about the flaws in the National Park System's wildlife conservation and protection program, Brown was inspired to write "Bison: Livestock or Wild and Free." The essay originally began as an analysis of the population management of bison within Yellowstone National Park, but during the researching process, morphed into a commentary on the significance of the bison to the National Park identity and our country as a whole. It comments on the bison's ties to our national culture through its associations with Native Americans, gender roles, conservation, and the concept of wilderness. Brown would like to thank her professor, Annie Coleman, for her advice and support throughout the writing process and for providing her with an eye-opening overview of the history of National Parks. 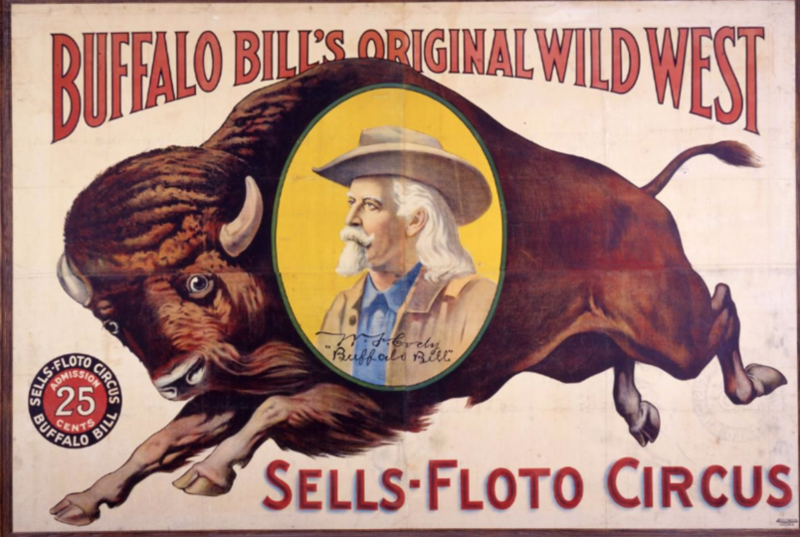 Buffalo Bill's Wild West Poster. 1910-1911. William F. Cody Collection, McCracken Research Library, Buffalo Bill Center of the West. <https://collections.centerofthewest.org/view/ameri...>. Butler, W.F. Sir. Sir William Butler: An Autobiography. London: Constable and Company, 1911. Flores, Dan. "Bison Ecology and Bison Diplomacy: The Southern Plains from 1800 to 1850." The Journal of American History 78, no. 2 (1991): 465-85. doi:10.2307/2079530. Goode, George W. Report of the Superintendent of the Yellowstone National Park to the Secretary of the Interior. Washington: Government Printing Office, 1889. "History of Bison Management." National Park Service. Oct 9th 2017. <https://www.nps.gov/yell/learn/management/bison-hi...>. Hon. W. F. Cody Buffalo Bill, Chief of Scouts and Guides for U.S. Army. 1876. McCracken Research Library, Buffalo Bill Center of the West.<https://collections.centerofthewest.org/view/hon_w...>. "I Am Coming," 1900. Courier Litho Co, McCracken Research Library, Buffalo Bill Center of the West. <https://collections.centerofthewest.org/view/i_am_...>. Isenberg, Andrew. The Destruction of the Bison. New York: Cambridge University Press, 2000. Nesheim, David. 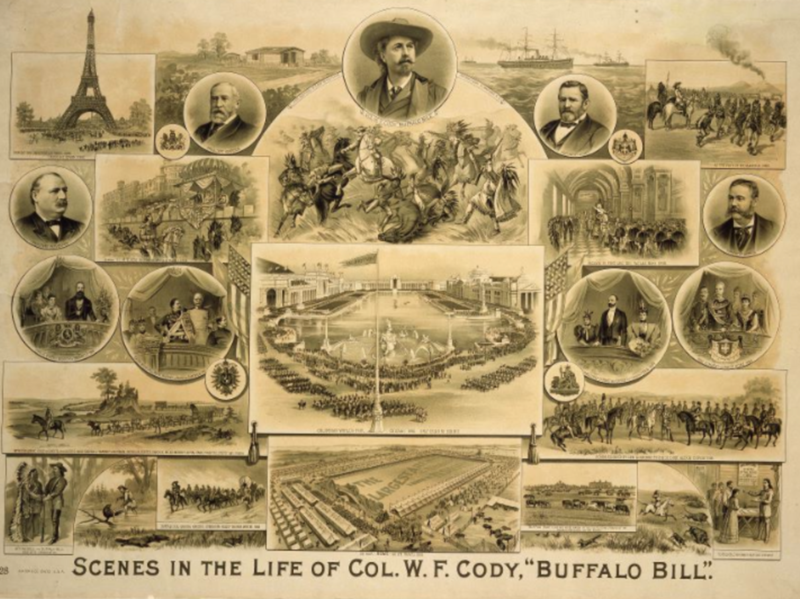 "How William F. Cody Helped Save the Buffalo Without Really Trying." Great Plains Quarterly. 2007. 163-165. Roosevelt, Theodore. Hunting Trips of a Ranchman and the Wilderness Hunter. New York: The Knickerbocker Press, 1885. Rydell, Robert W. and Rob Kroes. "Buffalo Bill in Bologna." In The Americanization of the World, 1869-1922. Chicago: University of Chicago Press, 2005. Sellars, Richard West. Preserving Nature in the National Parks. New Haven: Yale University: 2009. "The Capture of Howell," Forest and Stream, March 1894, nps.gov.